Luleå is a city in the North of Sweden. During the month of June, there are days in Luleå when the dawn time is 00:51 AM and the sunset is 11:43 PM. When the month of Ramadān falls in June, those among the minority Muslims of Luleå who can bear it, fast for about 23 hours a day. They have less than 2 hours to break their fast, do their obligatory and supererogatory prayers and have their suhūr before starting another day of about 23 hours of fasting. They do this due to the understanding that based on verse 2:187 of the Qur’ān they are expected by the Almighty to fast that long unless they are physically incapable of that. This is while at the same time their fellow Muslims in the Muslim countries are fasting for fourteen or fifteen hours per day. The popular advice for them is that if they cannot tolerate these long hours, they need to fast during other times of year. It will be a challenge. 30 years ago there were not this many Muslims living here in Sweden and especially not up in the North. Today it is a problem that touches more people. … For us the fasting takes around 20 hours. Many people think it will be hard. But it is always worst in the first days, then it usually gets better. This article is written solely to help with inquiries similar to the above. This articles aims to address a contemporary issue with regards to fasting that is specifically relevant to Muslims who live in certain geographical places like Northern Europe. After explaining and illustrating the issue, first the more popular and dominant view will be presented and discussed. This view will then be critically analyzed by comparing it with a less popular and less dominant view. The article ends with some concluding remarks where the advantages and disadvantages of each view are discussed and suggestions are given. According to this calculation for year 2010, the shortest fasting times for Makkah and Oslo were respectively 12 hours and 11 minutes, and eight hours and 43 minutes. This happened on 21st of December 2010. The longest fasting times for Makkah and Oslo were respectively 14 hours and 55 minutes, and 20 hours and 31 minutes. This happened on 23rd July 2010. While in Makkah fasting time changes only two hours and 44 minutes thought out a year, in Oslo it changes by 11 hours and 48 minutes. The difference between the longest fasting time in Makkah and Oslo is five hours and 36 minutes. The obvious problem here is the very long fasting days of summer in Oslo, that is representative of many other countries in the world with similar or even more extreme conditions. While in Makkah, the original centre of Islam, and in most other Muslim countries, people fast around 14 hours or so during the summer time; in some places in the world, like Oslo, the minority Muslim population (which is already disadvantaged by the lack of social support for their ritual fasting), needs to fast more than 20 hours per day that is about 1.5 times compared to fasting times of other Muslims. The continuous fasting for 20 to 23 hours per day for up to thirty days makes fasting during summer a challenge in places like Oslo and Luleå, which, for some Muslims, is difficult to manage. What makes this more difficult is that during the less than 4 hours (or about an hour in case of Luleå) that is available between sunset and dawn, the person breaks the fast, offers maghrib and ‘ishā prayers, perhaps wishes to participate in what is known as tarāwīh prayers and then also needs to have suhūr before starting another fast. - Verse 2:187 makes it clear that fasting from dawn to sunset is a definite directive. - Verse 2:185 opens a door that makes it unnecessary to change the fasting hours. The door is the simple permission to skip the fasting if one is ill or is in travel. The conclusion of the Dominant View from the above is that there is absolutely no way to change the time of fasting and that this is in fact not needed any way since the person is allowed to skip the fasting (if it is beyond his tolerance) and to make it up later. In addressing the issue of fasting during long hours, there is another view that is less popular but no less scholarly. According to this view, Muslims who live in the areas with extreme length of summer days are allowed to adopt a shorter daytime on the basis of a city that can be used as a reference point. It should be noted that all the above quotes are in answering inquiries about extreme fasting hours within 24 hours. The Less Dominant View is on the basis of the observation that fasting was not supposed to be a burden and something that would need to be tolerated. Fasting was supposed to be a symbolic exercise of patience and taqwā that was just enough to make the person feel the result of observing God’s directive for the month of Ramadān and to give him a limited opportunity to smoothly challenge his desires. a. Changing the time of fasting goes against the explicit instructions of the Qur’ān in verse 2:187 where the start and the end of the fasting are clearly mentioned. b. To suggest changing the time of fasting is in effect questioning the universality of the instructions of the Qur’ān. c. Ijtihād is only allowed where shari‘ah is silent, yet here the Qur’ān is not silent as we are given a clear solution in verse 2:185, where it says that a person who is ill and a traveller are not expected to fast. A. Response to the first objection, i.e. changing the time of fasting goes against the explicit instructions of the Qur’ān in verse 2:187. It is of course a fact that verse 2:187 has explicitly instructed us about the start and the end of the fasting in a day. The assumption of the objection is that the start and the finishing points here are the backbone of this instruction. This, however, is an assumption that can be challenged by looking at the chart that was given earlier in this article. It is obvious that in the Arabian Peninsula the instructed start and end points of fasting produce very smooth and reasonable fasting hours throughout the year. This seems to be directly associated with the fact that is given at the end of verse 2:185, emphasizing that God does not want to create difficulties for people. A simple question can be raised that when the Almighty says He does not want difficulty for people and wants ease for them, then how it is possible to justify that the religious duty of Muslims in, for example, Luleå is to fast almost all the day for several consecutive days (the fact that they are allowed to skip this if they cannot tolerate it and fast in a different time of the year does not cancel this question). It is possible based on the above mind exercise to argue that starting the fast at dawn and ending it at sunset is not the backbone of the instruction of fasting in the verse 2:187. Rather, it seems that the backbone of the instruction is the reasonable length of fasting that these two points produce for the location where the Qur’ān was revealed. Starting and ending the fast with natural phenomenon like dawn and sunset which also coordinates with prayer times is of course a blessing and is certainly a wisdom behind the given instructions in the Qur’ān. However, based on the aforementioned understanding, this blessing does not allow one to break the backbone of the divine instruction, which is the reasonable length of fasting. If we appreciate the above, then we can understand why the Less Dominant View does not agree this view goes against the Qur’ān. There is another way of addressing this objection as well which might be more acceptable by those who are more interested in the exact wording of the verse 2:187. The concept of “earth day” as quoted from Ibn Yūsuf Khalīl points to the fact that no matter when the sun rises and when it sets, for human beings, the routine of day and night activities are mostly unchanged. For example whether darkness starts at 4:00 PM or 11:00 PM, for a human being with a normal daily routine, the time of having dinner and sleeping is the same. Again, based on this alternative response, the Less Dominant view does not change the wording of the Qur’ān, but in fact seeks the intended meaning based on the understanding that many of the Qur’ānic expressions do not refer to a technical/scientific meaning of the expressions, but the common sense meaning of them. B. Response to the second objection, suggestion to change the timing of fasting means questioning the universality of the Qur’ān. Interestingly enough, it seems easier for the Less Dominant View to defend the universality of the Qur’ān and it seems like the Dominant View might have problems fully defending this. The Dominant View agrees with the Less Dominant View that in places far North where the length of day is more than 24 hours, the time of Makkah or a city with normal day and night conditions need to be adopted. However, if (as the Dominant View argues) the start and the end of fasting, as mentioned in the Qur’ān, is included among the universal directives of the Qur’ān then one may ask why was the directive not given in a way that it could apply to all places on the face of Earth. The Dominant View holds that the start and end points of fasting (as instructed in the Qur’ān) are universal, yet uses another criterion for places with more than 24 hours of sunlight. This seems like a contradiction. For the Less Dominant View, however, this contradiction does not apply. To them the universal element of the verse of the Qur’ān is not the start and end points of fasting, but is in fact the length of fasting that result from the start and end points in the Arabian Peninsula. In other words, the Less Dominant View has an understanding from verse 2:187 that supports the universality of the directives of the Qur’ān while the Dominant View holds an understanding that practically conflicts with the principle of universality of the Qur’ān. C. Response to the third objection, i.e. Ijtihād is only allowed where sharī‘ah is silent and here (with verse 2:185) sharī‘ah is not silent. The assumption of the Dominant View, which can also be derived from the above quote, is that obligation (taklīf) is to fast from dawn to sunset, irrespective of the length of the day. The Dominant View then considers those who cannot fast during this time to be exceptions and therefore applies the allowance given in 2:185 to these exceptions. Second, verse 2:185 is in fact silent about the issue of extreme time of fasting. It is the Dominant View that “interprets” the verse and “analyses” it to apply it to this new issue. It is therefore wrong to say that the Qur’ān is NOT silent about this issue, as a matter of fact, It is. The Dominant View itself has done ijtihād by applying the allowance in verse 2:185 to this contemporary issue. It is ironic that it then criticizes the Less Dominant View on the basis of the argument that ijtihād is not needed when the Qur’ān is not silent. Third, the analysis of the Dominant View is that since traveling and sickness to some extent incapacitate a person therefore the relief given in verse 2:185 is because of this. Analogously they then conclude that all situations which incapacitate a person to the same extent can also be subsumed under the concession given. There seems to be an illogical analogy here in that verse 2:185 is giving permission for exceptional cases where it is solely the specific situation of individuals (illness, travel), initiated in/by them, that makes it difficult for them to fast. However the issue of fasting long hours is not about specific situation of individuals initiated by/in them. Here it is the “Directive” (as advised by the Dominant View) not the “Individual’s Situation” that has caused the issue. This tiny yet important difference makes the analogy less than flawless. The Less Dominant View can also challenge the Dominant view by raising a theoretical question. 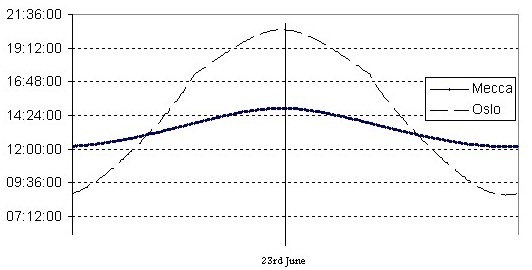 Looking at the following graph, it is clear that for areas at 66.6 latitude the daylight during June will be only a few minutes less than 24 hours (22). Whether in those areas there are any residents or not is not relevant. The question is, since theoretically Muslims can face this situation, where exactly the Dominant View draws the line. Does the dominant view advise that even if there are only 2 minutes to break the fast and start the fast again, Muslims in these areas should keep fasting according to sun dawn and sunset? This does not seem to be a practical advice. Surely even the Dominant View needs to accept the adjustment of fasting hours when the fasting time is getting extremely close to 24 hours. If the above can be appreciated, then there does not seem to be much difference between the Dominant View and the Less Dominant View. The difference will only be about where to draw the line, otherwise, theoretically both agree that at some point (within 24 hours day and night) the fasting time needs to be adjusted. a. Many can fast during long summer days so what is the need for the Less Dominant View? First, it needs to be appreciated that fasting is not supposed to be a marathon of not eating and drinking. As discussed above, looking at the length of fasting in the Arabian Peninsula, and in line with the general spirit of religious directives, fasting is supposed to be a practice that puts some pressure on us but does not entirely exhaust our energy. Many can keep fasting while in travel or while being ill. Yet because of the same principle we are not expected to fast in these situations. Second, the issue is not just about whether long fasting hours are tolerable or not. As discussed above, another point is that fasting time in Arabian Peninsula fits perfectly with the typical working and resting hours of a person and is therefore nicely integrated with the normal schedule of people. This is while extreme fasting hours clash with the normal daily schedule of life. Third, the Less Dominant View does not forbid fasting for the whole day in the extremely long days. It only provides an alternative and also a solution for those who find it difficult or against the spirit of fasting, to fast that long. b. People fast for extremely long hours during summer but then in a few years time they will fast for extremely short hours during winter. Does this not solve the problem by balancing the overall fasting time during years? The issue is not about overall balance of fasting hours. The issue is simply about abnormal fasting hours during the summer time in some of the areas in the world. The fact that the person will do extremely shorter fasting during winters does not take away the difficulty and abnormality of fasting during the long summer. c. If we follow the Less Dominant View then is it not fair to also adopt the Makkah time when fasting during the winter (when days are very short)? Fasting in winter where days are extremely short would have been an issue if the concern was merely to adopt typical fasting hours. This however is not the concern. The basis of the Less Dominant View is the advice given in the Qur’ān which runs in every religious directive, that is, God does not want difficulty for you. On this basis the point of focus and the problem in hand is only the extreme summer times. We should also appreciate that this is not a case of entering a business transaction where we need to adopt a ‘fair take and give’ policy with the other side of the business. We are merely servants of the Almighty. He does not need our acts of worship and certainly does not expect us to do more on the basis of ijtihād. Having said this, referring to the above graph, in places and times that fasting time might get extremely short (theoretically it can be as short as only a few minutes), there seems to be a reasonable ground to discuss whether longer hours of fasting need to be adopted. d. If we open the door for this way of reasoning, then we will get into the danger of changing many of the rules of sharī‘ah based on newly emerged issues. Before addressing the above, it needs to be noted that the scholars who hold the Less Dominant View are mostly categorized as the traditional and classic scholars of Islam. The views that were quoted for the Less Dominant View all come from such category of scholars and sources. These scholars are adherents to the most traditional understanding of Islam that at points can and has generated practical issues in some Muslim communities yet they have not changed their traditional views about those issues. The view of these scholars on the issue of extreme hour of fasting does not come from any radical way of thinking and is deeply rooted in their understanding of the traditional knowledge and approach of understanding Islam. However the main point is that the above concern is based on a wrong understanding of the reasoning of the Less Dominant View. The Less Dominant View is not suggesting changing a religious directive. Rather they argue that a religious directive has not been understood entirely. They have come to this understanding due to the emergence of a practical issue that is, fasting for extreme hours. This is not the first time that realising a practical problem prompts scholars to reassess their understanding of a religious directive in order to (not change it but) understand it better. If at any time in future another newly emerged issue prompts some of the most learned scholars of Islam to reassess their understanding of a religious directive, then this should be a reason to be proud about the scholarship of Islam rather than to be worried about it. - Since this is a matter of ijtihād and since the scholars who hold the Less Dominant View have not attempted to coordinate with each other and reach common specifications, there are a number of questions that will remain with more than one answer. From what length of day upwards should we consider adopting the times of a different city? Which city or what basis should be used as the point of reference? (24) How should one adopt the different times? (25) This subjectivity is of course a natural result of any act of ijtihād, however in this case the range of possible alternatives seems to be quite wide and the fact that there has been little attempt to bring some agreement on these issues makes the problem more complex. - We are well aware of the suffering of Muslims due to lack of unity. Even in the acts of worship like fasting we can see examples of this (e.g. Muslims observe the month of Ramadān and the ‘id on different days while being in the same geographical area). The Less Dominant View can easily result in yet further disunity in acts of worship among Muslims, especially considering the above point. The first point that needs to be appreciated is that the whole issue of extreme fasting time in some of the countries in the northern parts of the Earth and the way to deal with this issue is based on ijtihād (religious opinion). Accordingly, as long as this ijtihād is done based on religiously acceptable reasoning no one can and should consider one v to be the exact sharī‘ah and the other one to be against the sharī‘ah. Two views were discussed and evaluated in this article. There is a Dominant View that instructs that Muslims should fast from dawn to sunset irrespective of the length of fasting (as long there is a day and night within 24 hours) unless this is beyond their capacity, in which case they need to fast during another time of the year. In contrast, the Less Dominant View argues that Muslims who are facing extreme hours of fasting are allowed to adopt the fasting time of a different city in the world where the hours of fasting are more moderate. According to the Dominant View, the backbone of the instruction of the Qur’ān in verse 2:187 is the start and the end point of fasting while according to the Less Dominant view, the backbone of the instruction is the length of fasting that is supposed to be moderate. The Dominant View has a practical advantage in that it gives a specific solution that is straightforward. Accordingly the person either fasts irrespective of the length of the fasting or postpones his fast if fasting in extremely long days is beyond his capability. Also it seems like most people find themselves more comfortable with this view simply because it is literally in-line with the wording of the Qur’ān. On the other hand, it is difficult to digest and justify (on the basis of the Compassion and the Wisdom of the Almighty) the fact that while all Muslims fast for a maximum of 15 hours in their countries, there are those who are religiously obliged to fast as long as 20 - 23 hours a day. This simply negates the fact that God does not want to impose difficulty on people. To argue that people can choose to fast later in the year if they find it difficult is not an answer to the above. The question is not about what these people need to do; rather the question is: why are these people obliged to undertake such a difficult religious duty in the first place? The places where these extreme hours of fasting occur are all in non-Muslim countries. The minority Muslims are already disadvantaged due to lack of enough social support and lack of a ‘fasting atmosphere’ in these non-Muslim countries. The Dominant View puts them in further disadvantage by advising them that if they cannot fast during the extreme hours then they need to fast some other time in the year. This for many Muslims who live in these areas (especially mostly young and elderly) means that they have to fast when not even the minority Muslim community would provide support and inspiration (that is naturally provided during the month of Ramadān). Further, from the spiritual point of view it is understandable that for many individuals, fasting during the month of Ramadān is always more desirable than fasting during another month of the year. Another methodological problem with the Dominant View is its criticism of the Less Dominant View by bringing up the principle of universality of the directives of the Qur’ān. As discussed in this article, in practice, it seems like it is the Dominant View itself that does not adhere to this principle (when it comes to fasting time in places where there is no proper day in 24 hours). On the other hand the Less Dominant View has a conceptual rather than literal approach to the instruction of the Qur’ān about the time of fasting. The conclusion that is reached seems to be more in-line with the general spirit of religious directives and (as explained in the discussion section) it also fits with the issue of universality of the Qur’ān. However the Less Dominant View can result in a variety of different standards when it comes to practice. This is because there is no agreed upon ijtihād, within the Less Dominant View, on when to adopt the timing of a different place and what place or point of reference can be chosen for this (26). This can contribute to further disunity and perhaps clashes among the Muslim communities. Having said that, it also needs to be appreciated that different understanding of religious directives per se, should not create disunity. In other words, the problem of disunity is rooted in more in-depth socio-cultural and political platforms rather than mere different understanding of the religious directives. The first generations of Muslims too had a different understanding of religious directives, yet, they were much more united than Muslims of our era. It is important to appreciate that God expects us to act in accordance with an honest understanding of our duties. As long as a religious opinion is formulated with that honesty by people of knowledge and as long as those who accept that religious opinion are doing so in the honest pursuit of truth, there should not be any worries nor any clashes between the adherents of different religious views. This was surely the way of the first generation of Muslims who witnessed the Prophet of God (sws). May the Almighty guide us all in following their path. 2. There seems to be a major agreement that when there is no proper day or night within 24 hours, then the timing of a different city (which may be Makkah, the closest Muslim country, the closest country with proper day and night in 24 hours, etc.) needs to be adopted. 3. The figure is generated based on the calculation method of Makkah for year 2010, as given inhttp://www.islamicfinder.org. Since here the illustration is only for comparison purposes, other methods of calculation do not generate any significantly different results. 6. Islam Q.A. website, Fatwā number 5842 http://www.islamqa.com/en/ref/5842. For the original Arabic version, look up: Sa’īd ibn ‘Alī ibn Wahf al-Qahtānī, Al-siyām fi al-Islam fi Dhu al-Kitāb wa al-Sunnah (n.p. : Markaz Al-Da‘wah wa al-irshād, 1431 AH), 227. 10. Khālid ‘Abd Al-Qādir, Min Fiqh al-‘Aqaliyāt al-Muslimah, 124. 19. The point about possibility of interpreting the word ‘night’, in the verse, in a non-technical way was first brought to the author’s attention by Mr. Moiz Amjad, founder of Understanding Islam website (www.understanding-islam.com). 20. Saleem, S., Monthly Renaissance, August 2012. 22. 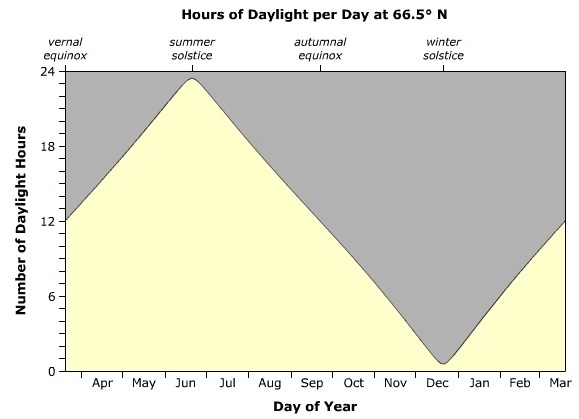 Note the graph is on the basis of daylight which is from sunrise to sunset. This of course will be shorter than fasting hours that are between sun dawn and sunset. However the graph can be used for estimation. 24. Some of the suggested options are Makkah, Madīnah, the closest Muslim city, the closest city with moderate length of the day, the average Earth day. 25. Some of the options are: starting with the dawn at the local time and ending when the length of fasting is equal to the length of fasting of the point of reference; starting after the dawn at the time when by the sunset the length of fasting becomes equal to the length of fasting of the point of reference; starting with the dawn at the local time but ending at the hours that is sunset in the point of reference. 26. Many of the scholars who hold the Less Dominant View seem to apply it to fasting beyond 18 hours. The popular advice for them seems to be to fast from dawn according to the local time but to end it when the length of fasting reaches to the same number of hours that Muslims are fasting in Mecca.